I recently began thinking about replacing my living room carpet. It’s pretty old and although there are amazing carpet cleaners on the market today, sometimes it’s good to just add something new. So, once I decided to buy new carpet, I started wondering about what to do with the old carpet that I was pulling up. I mean, I could just take it to the dump, but wouldn’t a DIY project be more fun? I found some wonderful ideas for repurposing old carpet. Some of these are seriously genius ideas and all of them can be done with old carpet or rugs, whatever you may have on hand. You can also do many of them with carpet samples, so if you have a few of those lying around, get them out and let’s do a repurposing project with them! Repurposing old items is such fun and it’s a really economical way to use up those items and get some new ones at the same time. Repurposing really does save you money and you can reuse practically anything. Just take a look at these 20 ways to repurpose broken mirrors. From ottoman makeovers to cat scratching posts and even some sensible cleaning supplies, you can turn those old carpet strips and rugs into some amazing things. There are boots – yes, boots! – coasters, window cleaners and so much more that you can make with leftover carpet or old carpet that you’re planning to replace. Of course, there’s always the option of reusing that carpet in another room – or on the staircase – but if you don’t have an obvious use for it, repurpose it into something great! There are so many wonderful things to be made with your carpet, just like there are so many wonderful things to be made with old ladders – just check out these 40 repurpose ideas for wooden ladders to get some great ideas. Let’s take a look at 20 amazing ways to repurpose that carpet and add a few beautiful new pieces to your home and garden. I hope you enjoy these ideas as much as I do and I hope you’ll share which one you used to repurpose your carpet! A new ottoman will likely set you back a couple hundred dollars, especially for a really nice upholstered one. You can instead make this DIY upcycled rug ottoman and save yourself a little money. Plus, it’s a great way to use up that old carpet. 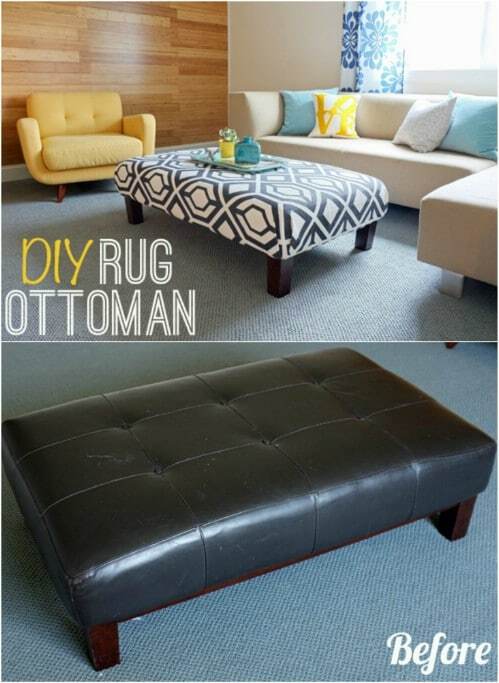 If you have an old ottoman that you want to reupholster, this is the perfect DIY project. If you don’t have an old ottoman, you can pick them up at thrift stores, normally for around $10 or so. Yes – boots! 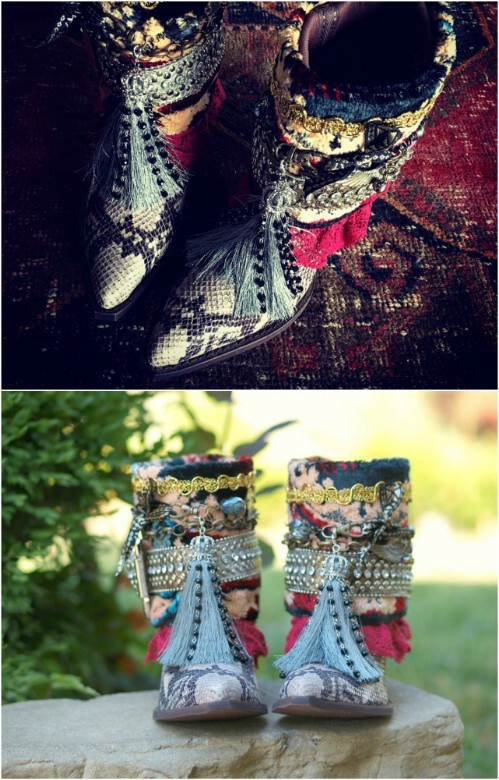 These boots are decorated with strips of old carpet and they’re amazing! I love the design and they have so many wonderful upcycles in them. There’s carpet, tassels, lace, rhinestones and so much more. If you love cowboy boots and you tend to want to make a statement wherever you go, these are perfect. I found them on Etsy for under $200. You could of course, always do them yourself but these are just a bit of perfect. 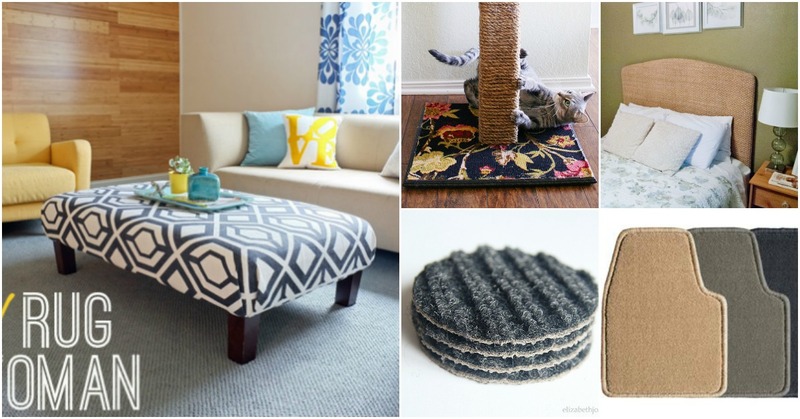 I told my daughter just the other day that we need a cat scratching post – and then I ran across this great DIY using upcycled carpet. Building it is really easy. You just need a 2X4 or more if you want to make a post for multiple cats. The carpet strip lies on bottom to make it scratch-worthy and to give it a decorative look. You could also use carpet to cover the 2X4 if you prefer that to the rope. Window screens are so difficult to get clean – especially during the summer months when bugs and dust literally get wedged in them. You can take that old carpet and cut it into handy strips for cleaning those screens. Just cut the pieces into washcloth sized strips and then use those along with soap and water to get your screens perfectly clean. Turn old carpet into wonderful new coasters! 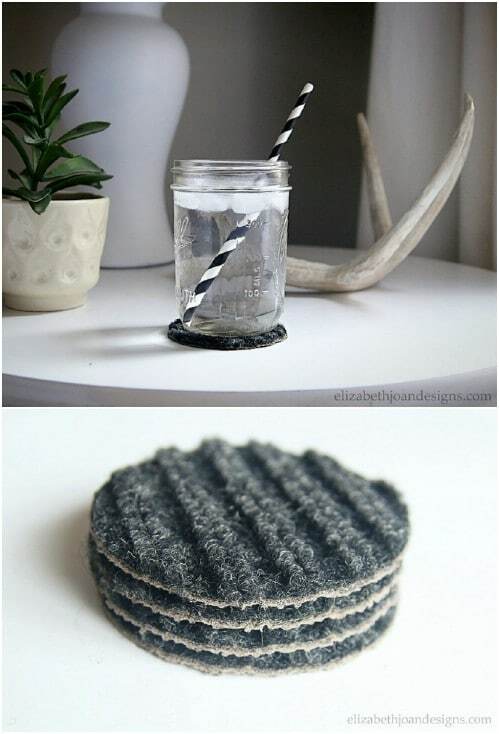 The carpet is great for absorbing liquid – like that horrible condensation that drips down your glasses – and if you’re going to throw it out anyway, why not just turn it into coasters? If you have indoor/outdoor carpet, that works wonderfully but you could use regular indoor carpet as well if that’s what you have on hand. Use a mug to shape the circles and then just cut the carpet to shape. The thing I really hate about keeping my car clean is how dingy my floor mats get. 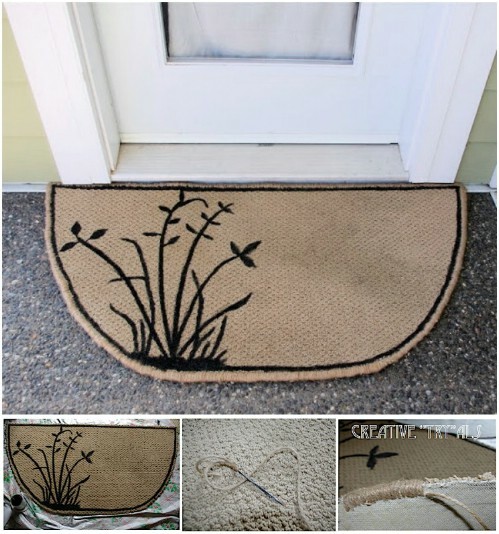 I love this idea of making new customized floor mats with old carpet. 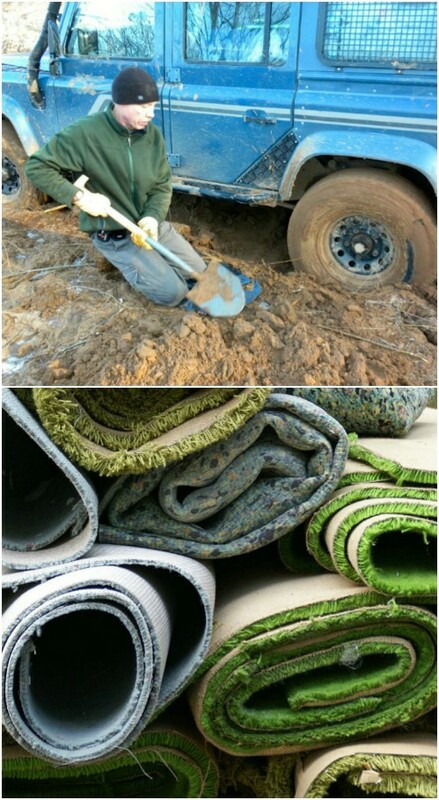 You just measure the size and shape that you need using your old floor mats. 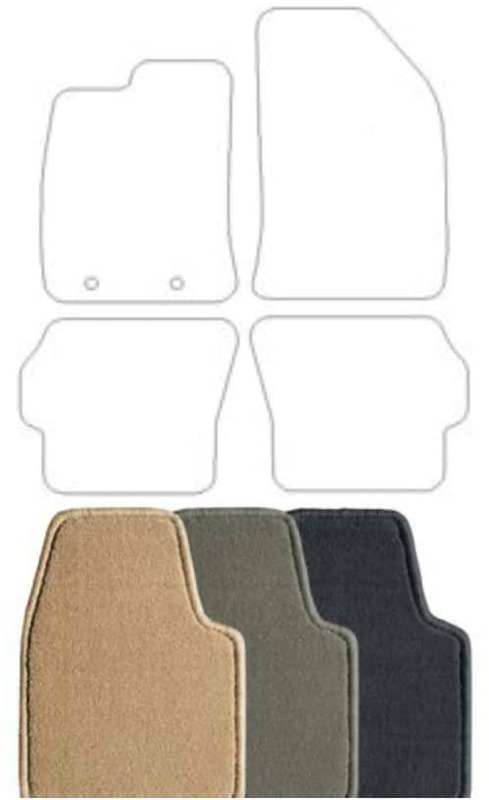 If you currently have rubber or plastic mats, these carpet mats are going to really make you feel luxurious, and it’s a really simple process to make them. Binding tape will perfectly seal the edges and keep your mats from unraveling. 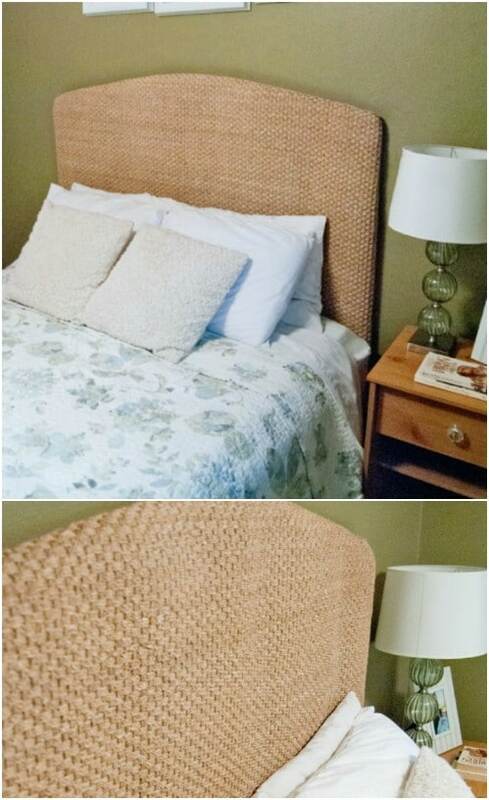 You can make a nice upholstered headboard using old carpet or a small rug. You basically just shape the carpeting around your headboard to give it dimension. It creates a stunning new look and this is a really simple DIY. You’ll need batting to give it that nice cushiony look and a few staples or small decorative nails to hold it in place. You can do this in so many ways and all of them will look beautiful. Take that old carpet and use it to make a wonderful seat for your stools. 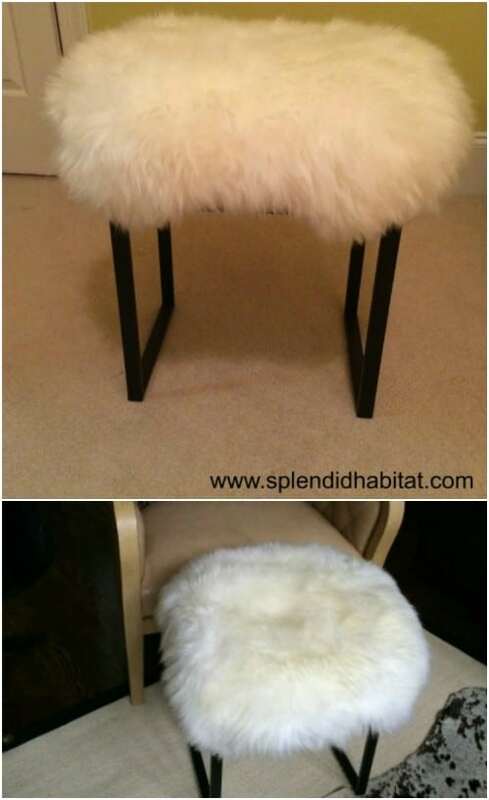 I love this one that is made with an old sheepskin rug but if you prefer something a bit less fluffy, you can use the exact same concept to cover any of your stools or benches and make them a bit more comfortable and decorative. You could even cover outdoor stools with indoor/outdoor carpet or use old woven rugs to create some beautiful quilted designs. Carpet is perfect for creating a custom door mat and this project is so simple you can have it completed in no time at all. You can paint the carpet with latex paint, which is relatively inexpensive, and give it a great personalized look. These would be great for housewarming or wedding gifts or just make a few and place them next to all of your exterior doors. The next time you head out to your garden to plant or to remove those weeds, take along a scrap of carpet. You can fold the carpet up and place it under your knees while you work. Not only does this help you to keep your pants or legs from getting dirt or grass stained, it also serves as a cushion for your knees so you won’t be nearly as sore when you get up. Old carpet is perfect for keeping your compost insulated. The thing with compost is you want it to remain the right temperature and you want to keep critters out, right? Carpet over the top of your compost pile will keep it plenty warm in the winter time and ensure that no creepy crawlies or rodents get in and ruin all of your hard work. When it’s time to use the compost, just remove the carpet and toss it away. 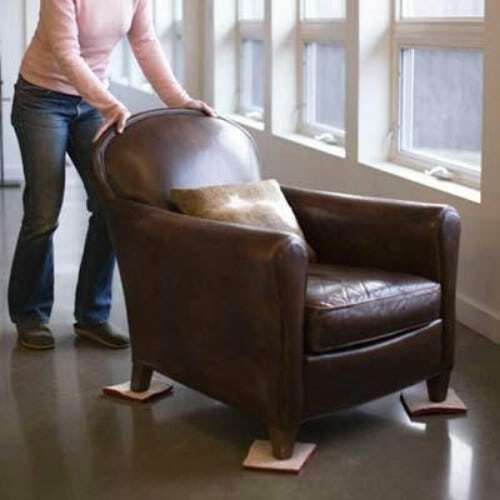 Moving furniture can be painful and difficult – not to mention it can scratch your floors. If you need to move your furniture about on tile, linoleum or hardwood flooring, add a few strips of carpet under the furniture legs first. It will help tremendously to slide that furniture around and it will keep heavier items from causing scratches or tears in your flooring. That old woven rug or strip of carpet can be used to create this gorgeous wall hanging when you add just a few additional materials. You just start with the carpet or rug as a base and then use a crochet hook to add colorful tassels with yarn. I love how easy this is and it’s a great DIY way to get an amazing tapestry without heading over to Pottery Barn and spending a small fortune to buy one. Carpet is after all carpet, so why not use it to line your dog’s house outdoors and make it cozy? You just cut the carpet into whatever size you need and then use staples or nails to hold it in place. This is a wonderful way to pamper your outdoor pooches and to help keep them warm when the weather is a bit cool. Indoor/outdoor carpet is wonderful for this but you could actually use any carpet that you have on hand. Dreading laundry is bad enough on its own without worries of your washer sounding like an old clunker all throughout the house. If your washing machine or dryer tend to make bumps when you use them, you can use carpet strips to quiet them down. Just cut out squares from your old carpet and place them under the legs of your appliances. This is a wonderful way to turn down the noise and give yourself a bit more peace and quiet. If you tend to bump the side of the garage when you get out of your car, you can save yourself some frustration (not to mention a lot of money in car repairs) by placing carpet strips on the garage wall. Line up your car where you normally park and glue carpet strips so that when your doors are open, they’ll hit the carpet instead of the concrete. This is great if you have small children who tend to bounce out of the car without watching what their doors may hit. Turn that old carpet into an amazing new area rug with just a little work. 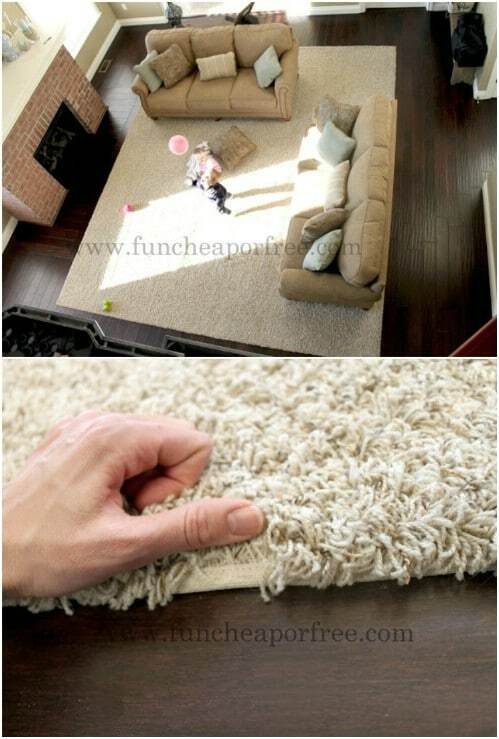 This is a great idea if you need multiple rugs around the house and want them all to stick to a specific theme. Forget about spending a couple hundred dollars for an area rug and just make it yourself from your old carpet. If the carpet is old and dingy, you may want to clean it up first and maybe find a section that has the least damage. Smaller pieces of carpet or old throw rugs can also be turned into gorgeous throw pillows. I found this beauty on Etsy but you could easily recreate the concept if you wanted. If you don’t have an old throw rug or any carpet to use, you could just as easily pick this one up on Etsy for around $130. 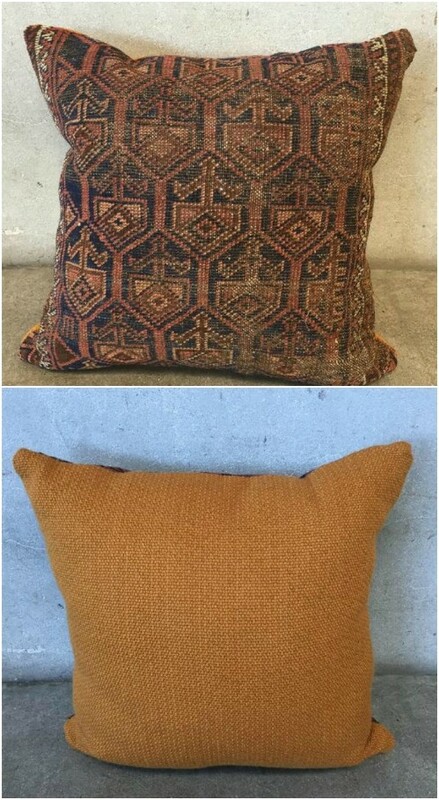 Of course, if you have a few old rugs, you could make an entire set of throw pillows for the couch or bed. We don’t get a lot of snow here in the South but you can bet that when it does snow, I’ve got my trunk filled with blankets and other cold weather necessities, like strips of carpet. Why carpet? Because if you get stuck in the snow, carpet helps you to get traction. This is a great trick and one that will save you a fortune over having to call a tow truck to get you going again. Just keep rather long strips of carpet rolled up in your trunk and grab them whenever you feel the need for additional traction. If you’re redoing a room and need to hang sheetrock, you’ll want to keep an old piece of carpet handy. 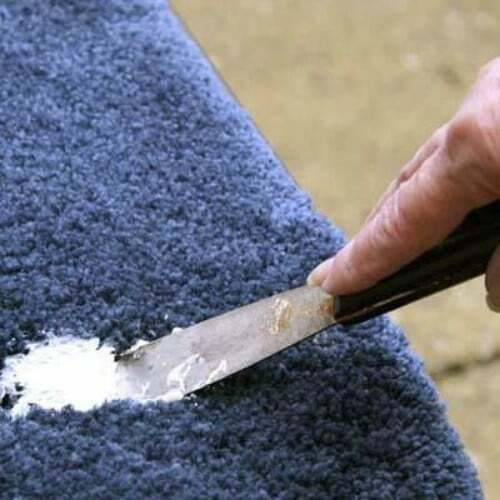 You can use the carpet to wipe your putty knives and other tools clean so that you get a perfectly neat and clean edge every time. Instead of wiping those tools on the side of the bucket and getting them even gunkier, use carpet to completely remove mud and leave your tools perfect while you work. 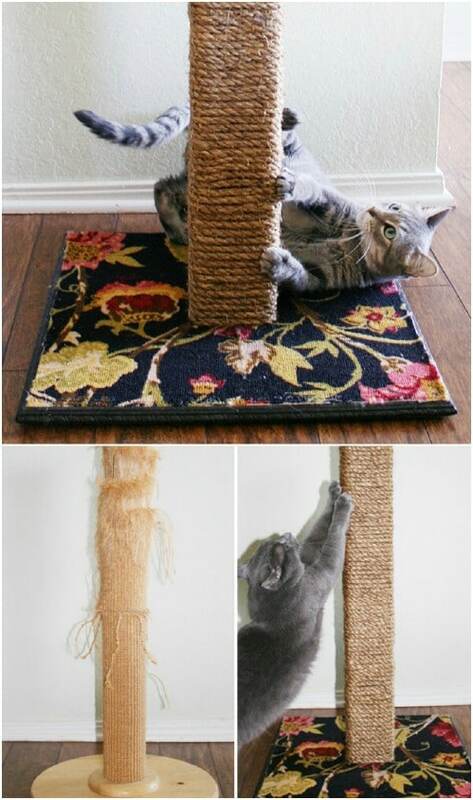 awesome ideas to repurposing old materials to make a cat scratching post to help keep a cat entertained for hours…and help to save your furniture!